by Byron Bixler So fragile is that precious thing called love. The memories, the fragrances, the images that linger; all dissolved in a moment of doubt and the acknowledgement of profound delusions. In his previous film, Weekend, Andrew Haigh found emotional authenticity in a blossoming romance between two men. It was young love – spontaneous, raw and untested by the recurring issues of a deep history. 45 Years finds Haigh confronting another relationship, this one fraught by the baggage of an entire lifetime. 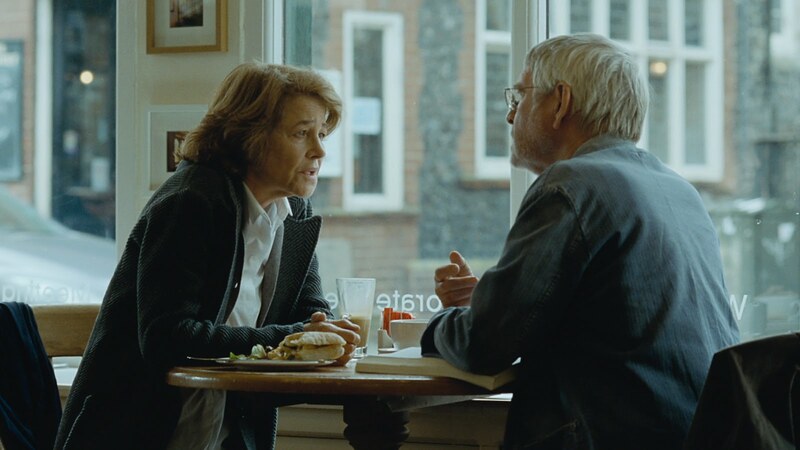 Kate (Charlotte Rampling) and Geoff (Tom Courtenay) are nearing their 45th anniversary. Retired and relatively comfortable, they wile away their twilight years in a small house in the English countryside. A letter arrives one day, a week before the celebration. It’s addressed to Geoff, and the details enclosed are morbid, dredging up memories of the woman he loved passionately – years before he ever met Kate. What begins as a cause for passing reflection soon proves to disrupt the contentment the couple has long enjoyed. Geoff’s feelings for this other woman clearly run deep, as an air of nervous distraction engulfs him, leaving Kate to silently agonize over the legitimacy of their bond. Haigh manages the drama with supreme delicacy, and his understatement of emotional beats gives the film a refreshingly realistic feel. The impact of the letter doesn’t drop like some great, sensational hammer; the approach is far more elegant than that. Details of the person and incident in question are given in fragments; allusive and indirect in nature. This hazy, but richly felt past haunts the picture, and the ghostly sentiment comes to physically manifest in the form of old keepsakes locked away in the attic. Dusty photos and fraying journal pages are handled with more dread than any spectral relic and the feelings they evoke are twice as heavy. Most of the characters’ turmoil is kept inside. Every revelation and every little twist of the heart is expressed with impeccable subtlety. Haigh’s patiently observational camera picks up notes of disillusionment, anger and crippling uncertainty in sequences as seemingly trivial as a lonely ferry ride, a solo piano session, or a poignant dance for two. When dialogue occurs, the words are made to count, but the power of 45 Years is derived from its quieter moments and the director’s considerable knack for suggestion is only half of the reason for this strength. The contributions of Rampling and Courtenay cannot be praised enough. Few actors could communicate so much with so few words and handed this challenge, the experienced pair delivers a couple of sensitive performances. Their chemistry is remarkable, for even in periods of hesitancy and confusion, one can sense the genuine concern the characters have for one another. There’s a scene towards the end that stands out in particular. Kate confronts Geoff about a somewhat harmless deception, but Rampling’s approach to the potentially volatile moment is quite nuanced. She toes the line between anger and empathy – her clenched jaw and searching eyes expressing a restrained firmness that hints at some underlying compassion. Rampling’s facial acting is remarkably complex, as the crux of the film’s most emotional scenes rely on these minute shifts in her expression. Meanwhile, Courtenay conveys Geoff’s festering agitation (and ultimately, his resignation) with a wandering, pitiably lost sensibility. This is not a film that one watches lightly. With meaning stowed away in such things as a lit cigarette and a pair of tightly-shut eyes, it’s imperative that close attention be paid to Haigh’s deceptively simple direction. The narrative may be too slow and distant for some, but for the discerning viewer, 45 Years will surely strike a chord as it gently unfurls the scope of its sentiment. Here lies a sad, romantic treasure, a testimonial to the complications of love and a gentle elegy for an insuppressible past.